Hyundai is one of the most popular passenger car manufacturer in the world and it is currently one of the largest automakers in the Indian market as well. The company is riding high on the success of its elegant sedan model Hyundai Verna, which is available in both diesel and petrol variants. The Hyundai Verna Fluidic 1.6 CRDi EX is one of the mid level variants in the series and it is powered by the 1.6-litre CRDi VGT diesel engine, which is coupled to a 6-speed manual transmission gearbox. This engine is extremely powerful in its class and also very fuel efficient with an ability to give away 22.32 Kmpl of peak mileage. This particular sedan is loaded with several exciting set of features both inside and out. One should talk about the appearance and style of this sedan, which is absolutely magnificent in comparison to any other sedan of its class. Inside this vehicle, the cabin is very spacious and eye-catching. The South Korean automaker has used high quality material that is giving a plush environment inside the cabin. As far as the safety aspects are concerned, the company is offering this particular variant with many features including airbag, ABS with EBD, impact sensing auto door unlock, immobilizer, central locking system and various others. The exterior design and structure of the Hyundai Verna Fluidic 1.6 CRDi EX trim is quite alluring in comparison with any other vehicle of its class. This sedan from the South Korean auto major comes with Fluidic body structure that made it look like a next generation vehicle. To start with the front profile, you can see a hexagonal shaped radiator grille decorated with a chrome plated strip and company logo. This grille is surrounded by a stylish headlight cluster that comes incorporated with powerful halogen lamps and turn indicators. The body colored bumper under this grille has a very sporty design and it comes integrated with fluidic style fog lamps that adds more elegance and style to the front. On the side profile, you can notice the fluidic body structure and style with expressive lines and designs. This fluidic design makes the Hyundai Verna as a unique model in the automobile segment. The wheel arches have been fitted with the alloy wheels, which are covered up with full wheel covers. The ORVMs and exterior door handles are painted in body color while the window sills gets the glossy black color coating. The rear end of this four wheeler has a very stylish boot lid along with striking taillight cluster that adds the dominating look to the rear. The Hyundai Verna Fluidic 1.6 CRDi EX trim comes with an absolutely fascinating interior cabin with plush cabin environment and rich interior design. The dashboard is very stylish and its central console is beautified with high gloss black and woodgrain finish. One can also find this wooden finish on the door panels . The steering wheel is very stylish and it is accentuated with mat-silver garnish. The company designed this vehicle with dual tone beige and black color scheme and complimented it with blue interior illumination, which will make the occupants to feel luxurious. The seats are very wide, well cushioned and have been covered with premium fabric upholstery. For enhancing the level of comforts and convenience, the company installed several exciting utility based functions inside the cabin such as power windows, height adjustable front seatbelts , front map lamps, theater dimming interior lamp, driver and passenger vanity mirror, sunglass holder, front passenger seat back pocket, driver information display and lots of other functions. The South Korean automaker has powered this particular variant with a highly reliable 1.6-litre CRDi VGT diesel power plant that comes with 4-cylinders and 16-valves. The displacement capacity produced by this engine is 1598cc that allows it to unleash a maximum power of about 126.3bhp at 4000rpm and at the same time it yields a maximum 259.9Nm at just 1900 to 2750rpm, which is quite good for city road conditions. The company coupled this particular engine with a 6-speed automatic transmission gearbox that contributes for the smoothness of the engine and its fuel efficiency. According to the company, this vehicle has the ability to give away a staggering mileage of about 22.32 Kmpl, which is best in its class. 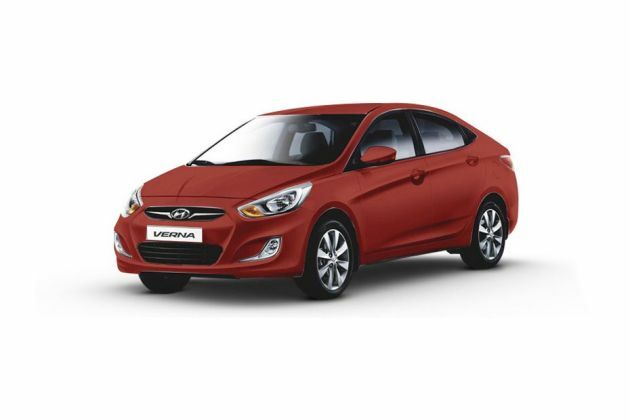 The company hasn't compromised on the braking and handling aspects of the Hyundai Verna Fluidic model. The company fitted the front and rear wheels of this model with a set of highly reliable disc brakes that is further assisted by the anti lock braking system. This will enhance the overall driving experience by reducing the risk of skidding at sharp curves. When it comes to suspension, the front axle of this sedan is fitted with the McPherson Strut system with coil springs and stabilizer bars, while the rear axle comes fitted with the couple torsion beam axle type of suspension system. Furthermore, the electric power steering system of this sedan is very responsive and acts instantaneously in all situations. The Hyundai Verna Fluidic 1.6 CRDi EX trim is one of the mid range variant in its series and it has been bestowed with several exciting comfort features. Some of the most important features include key less entry function integrated on foldable key, Bluetooth Connectivity with steering mounted call controls, an automatic air conditioner, electrically adjustable outside rear view mirrors, electrically foldable outside mirrors, electro chromic inside rear view mirror, driver information display, driver and passenger vanity mirror, front seat back pockets, sun glass holder , MT shift indicator, alternator management system, height adjustable front seat belts, and lots more. Also this variant comes with a 2-DIN MP3 player with AUX-In, USB sockets, iPod cable and with steering mounted audio controls. This mid range trim comes incorporated with standard safety aspects such as airbags, an advanced engine immobilizer system, impact sensing auto door unlock, clutch lock system, central locking system, front and rear disc brakes with anti lock braking system , front fog lights and lots more. Pros: Engine power is good, best in class mileage. Cons: More comfort features can be added, price should be in a competitive range.